Will Democratic U.S. Rep. Beto O'Rourke, at the top of the Democrats' statewide ticket, stand on the sidelines as his party goes all out to defeat his friend, U.S. Rep. Will Hurd, in 2018? SAN ANTONIO — Not long after U.S. Rep. Beto O'Rourke, D-El Paso, opened the floor to questions last month at a town hall here, Trish Florence rose to ask the U.S. Senate candidate about "the bromance" — his friendship with U.S. Rep. Will Hurd, R-Helotes, that was cemented by a cross-country road trip in March. A few knowing chuckles rippled over the crowd. "I really, really want to get behind you," Florence said, "but I can't do it if you're helping Hurd get re-elected." O'Rourke held firm in what's become his go-to answer to such questions — that as a member of the minority party in Congress, he needs to work with everyone he can — including, yes, Republicans like Hurd — to get things done for his constituents. Yet the exchange put on vivid display the awkward position O'Rourke, who is challenging U.S. Sen. Ted Cruz, R-Texas, finds himself in as he leads the Democrats' statewide ticket for 2018 while maintaining a high-profile friendship with their No. 1 target. The question that Florence and others are now pondering: Will O'Rourke stand on the sidelines as his party goes all out to defeat Hurd in 2018? The answer, for now at least, is yes. "I can't work with Republicans if they think I'm trying to screw them by working against their re-election, so I'm going to stay out of that race," O'Rourke said in a recent interview with The Texas Tribune. "I wish the people of that district the best in choosing the best person to represent their interests. I'm not going to be a voice in that election." The race to unseat Hurd, whose 23rd Congressional District has flipped back and forth between Democratic and Republican Party control in recent years, is already well underway. Gina Ortiz Jones, a former Air Force intelligence officer, announced she was running earlier this month, while two more Democrats said they were in last weekend: Jay Hulings, a former federal prosecutor from San Antonio, and Rick Treviño, a high school teacher from San Antonio. Mary Bell Lockhart — the county chairwoman of the Democratic Party in Brewster County, near the far west end of Hurd's sprawling district — said she had no problem with O'Rourke's road trip with Hurd. She said she doesn’t expect her elected officials from different parties to be “enemies” and that she viewed the trip as an opportunity for O’Rourke to positively influence Hurd, whom she described a poor representative of the district. But Lockhart’s tone changed when she was informed O'Rourke has said he's staying out of the 23rd District race in 2018. Added Florence: "The DCCC — the party itself — is working to flip Hurd’s district, and I cannot make sense of that to save my life — why Beto would continue to prop Hurd up when his own party is trying to take him down." She is not the only Democratic activist with an interest in the 23rd District who is unnerved by what could be the political implications of the Hurd-O'Rourke friendship. Rosey Abuabara, the co-chair of TX23 Indivisble, said a group of activists has been approaching O'Rourke at public and private events — including a fundraiser in San Antonio — to try to convince him it's not worth cozying up to Hurd. At the fundraiser, the activists got O’Rourke to raise his right hand and make a pledge to them regarding Hurd. 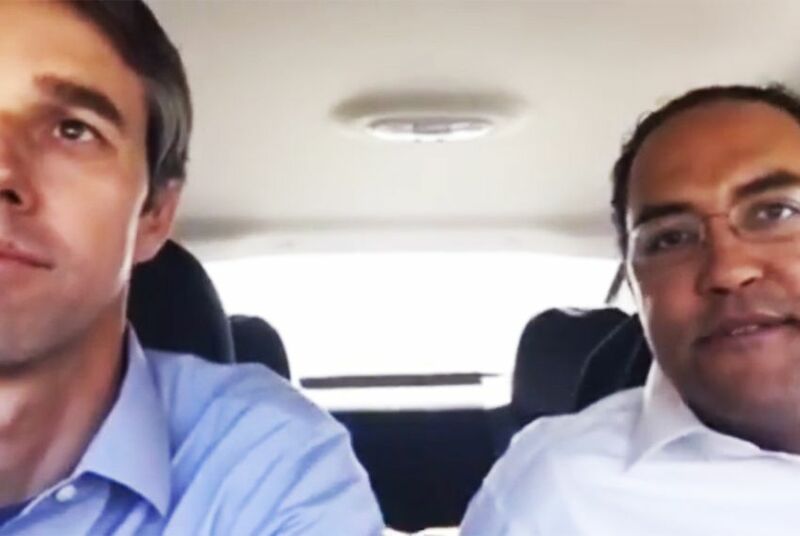 "Will Hurd is a good friend, I like working with him, but I have sworn to Indivisible 23 that I will not make him look cool,” O’Rourke said, according to video that the group posted on Twitter. To be sure, there have been some signs that O’Rourke has been listening to Democrats who want him to go tougher on Hurd. During his remarks before taking questions at the San Antonio town hall, he singled out Hurd for recently voting in favor of a House spending package that included $1.6 billion to get started on President Donald Trump's proposed border wall. It is a vote that will likely be key to national and state Democrats’ case against Hurd in 2018 as someone whose rhetoric does not match his record. "You know that I've got a strong friendship with one of the Republican representatives here, but Will Hurd voted for that, and you need to let him know how you feel about that, OK?" O'Rourke said to scattered boos and hisses. "He's a good friend, we're going to work together on important issues, but you know me — I think we all need to be held accountable for the decisions we make." "I'm disappointed in that vote," O'Rourke later said in his response to Florence's question. "He knows that." Hurd, for his part, has noted that he was one of only five Republicans who voted against the procedural maneuver that added the $1.6 billion to the legislation but voted for the package as a whole because it included funding for important, unrelated programs. The San Antonio town hall wasn’t the only time O’Rourke came face-to-face with opposition to Hurd. Toward the end of an event earlier this month in Alpine, O’Rourke paused his remarks to recognize a special guest in attendance: former U.S. Rep. Pete Gallego, who was unseated by Hurd in 2014 and unsuccessfully challenged Hurd in 2016. Gallego is seriously considering another run to reclaim his old seat. "I know he's got a decision to make about an important race that he may run soon, and we wish him all the luck in the world," O'Rourke said, turning to address Gallego. "We were grateful to get to know you while you were in Congress and hope that you are successful in whatever you do next, including making the decision." In a July interview, O’Rourke said he has long admired Gallego. Asked if he would campaign with Gallego if he became the 23rd District nominee again, O’Rourke said he had not “thought that far through” at the time. If O'Rourke is keeping his distance from Hurd's race, Hurd is doing the same for O'Rourke's. Yet Hurd has made clear he does not believe his El Paso colleague stands much of a chance. "I think Beto is a good guy," Hurd said in an interview before one of many town halls earlier this month where he talked up their road trip as a model for bipartisanship. "I think he's willing to show a fearlessness, but Sen. Cruz is one of the most popular politicians in Texas and has an incredibly organized and formidable organization, so as I've said, I think ... our junior senator, Mr. Cruz, is going to continue as our junior senator." Abuabara, the TX23 Indivisible organizer, had another idea for how the bromance could culminate. "If Beto doesn't win in 2018 and hopefully Hurd doesn't win in 2018," she said, "the two could do a reality show together."